When Boston coach Lynn Patrick was asked who he’d pick between Rocket Richard or Gordie Howe he answered, “Neither! I’ll take Red Kelly!” The only player to have won eight Stanley Cups without playing for Montreal, Red began his life in hockey on the cedar swamps near Port Dover, Ontario, and went on to win accolades and championships as a Detroit Red Wing and Toronto Maple Leaf. Go back in time with Red as he reminisces about his childhood: the time he nearly drowned; when he brought St. Michael’s College to three provincial championships; and his jump into a career with the NHL where sportsmanlike conduct won him multiple Lady Byng trophies. While playing with the Leafs, he served as member of parliament in Lester Pearson’s government. After retiring in 1967 as a player, Red coached for a decade in the NHL with Los Angeles, Pittsburgh, and Toronto. This is a fascinating biography of a life well lived — on and off the ice. It talked about red Kelly and his life. What teams he played for. 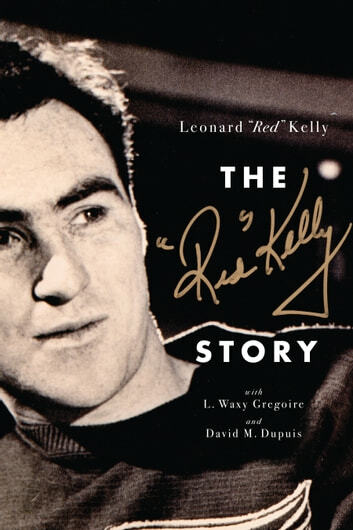 Red Kelly is the unsung hero of hockey. He played and helped so many hockey legends. He is himself one but somewhere forget. Eight Stanley Cups without being a Habs. An incredible career. A must read. Some parts were interesting, but much was boring rehash of hockey games. Recommended for diehard nostalgic fans only.